Many times the novice or even experienced rodder looks upon something they've never done before with more than a little trepidation. Installing a Mustang II kit might seem like a daunting task to some, but it's really very easy. There are a lot of people manufacturing these kits today and it's not the purpose of this exercise to recommend one over the another. 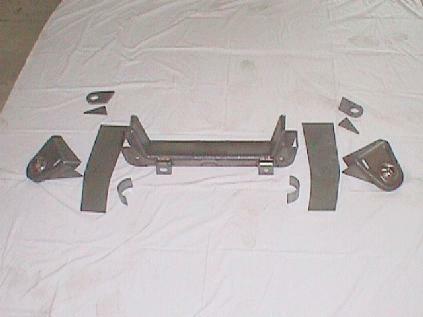 What these pages will attempt to do is illustrate the installation of the typical Mustang II suspension. At the end of each sequence you will see a clock. This clock shows the actual elapsed time from the start of the installation to the completion of that task in the process. This will give you a pretty good idea how long each task takes and you'll see that in most cases a Mustang II suspension can be installed in one afternoon. These are the parts that will be included in the typical kit. A crossmember, spring tower "top hats", boxing plates (if required), and strut rod mounting brackets. This kit included "C" notch pieces witch will be explained later. It's always a good idea to lay everything out just to make sure you're not missing anything. 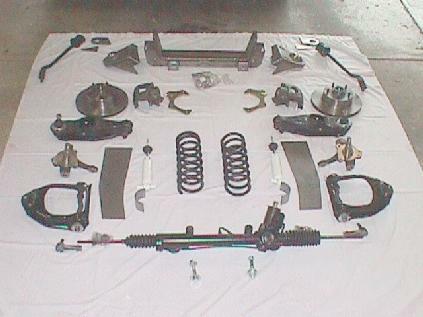 Here are all the parts required to install the entire suspension. Besides the basic kit you see the upper and lower control arms, strut rods, spindles, GM 11" disk brakes, calipers and mounting brackets, and a set of V8 springs and shocks. It may seem like a lot but not to worry, all are available either at your local wrecking yard or new from one of the many suppliers. In this case the lower control arms and strut rods were purchased at a swap meet and everything else is either new or factory rebuilt. Total cost for what you see here was just about $1000. 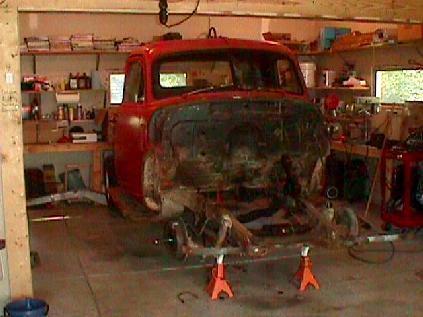 Here we have the subject of this exercise, a 1953 Chevy 1/2 ton pickup. 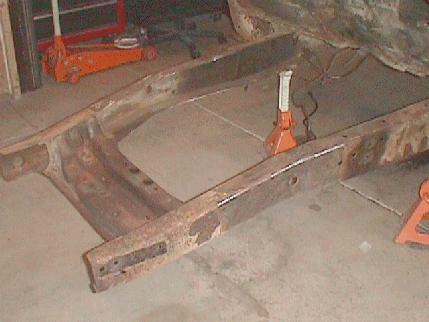 In preparation for this installation the front sheet metal has been removed as has the original Stovebolt "Blue Flame" 6 and transmission, however the solid axle is still in place. 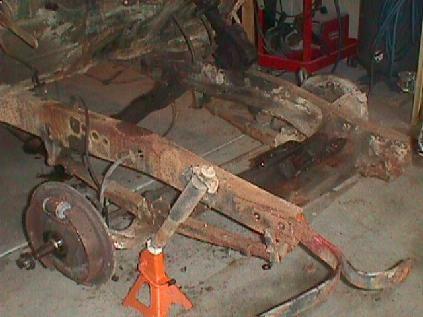 Once the original solid axle, springs and mounting brackets are removed the frame rails can be degreased and ground clean of rust. This frame will be coated with POR-15 which adheres best to a rusted surface so only the areas where welding will be taking place were ground to bare metal.